This campaign season we’ll hear a lot about “statistical ties.” The “statistical tie” misnomer is used to refer to the situation where one candidate leads another candidate but that lead is within the margin of error (MOE). However, what we’re really interested in is the probability that one candidate leads the other candidate. Since polling all voters is a costly and time consuming process, a random sample of voters is selected and, based on some assumptions, one can make a probabilistic judgement regarding the outcome of an election. Polling all voters yields the “true” percentage while the random sample can only estimate the “true” value. Every time a sample is taken, a different (perhaps) estimate of the “true” value is obtained. The estimate plus and minus the MOE is called the confidence interval. A 95% confidence interval says that 95% of the sample estimates will lie within that interval. 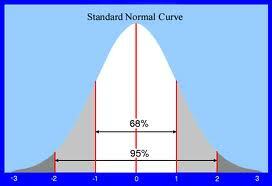 Also, a 95% confidence interval says that we are 95% certain that the “true” value lies within that interval. Consider two candidates, Smith and Jones. We want to know what percentage of the voters prefer Smith and what percentage prefer Jones. The “true” percentage is unknown so we randomly sample the population to obtain an estimate. We want to be 95% confident that our estimate lies within the “true” percentage plus-or-minus three points. 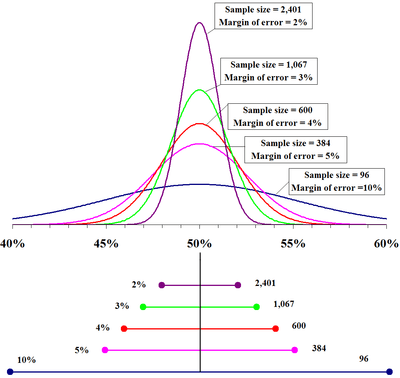 The figure at the right determines the sample size for different MOEs. Sample sizes usually assume an infinite population and a correction factor is only required when dealing with very small populations. After our poll of 1067 likely voters, Smith leads Jones 49-46% with an MOE of 3%. Some would call this a “statistical tie” since the lead is within the MOE. However, the following table tells us that Smith’s lead is 84% probable. H/T: Kevin Drum, Fritz Scheuren. Blouise, nice (G)avatar, is that the lake you live near? Tony, question regarding polls, MOE’s and weighting: What factors are used to determine the MOE? The better half once had a long, pleasant and informative discussion with a pollster about the propensity of the people in my city to refuse to talk to pollsters. The pollster called my house 4 times in a row and was told “no thanks” to the invite to take part. She explained (and begged for participation) that people in my city simply did not want to participate in polls, we were a weird bunch, so the outfit she was hired by had to just keep calling people until they got their required number of respondents in various specific groups before a pollster could turn in “incomplete” results. She explained they had to call the same number up to a maximum of 4 times before they could move on (asking to speak to anyone, or anyone else in the household) because there were so few people that would participate and people/numbers that were put on the list satisfied certain demographic requirements so responses from each desired group were at a premium. True story. I’ve been called 3 different times by political pollsters so far and refuse to participate each time. I don’t do polls. I was wondering if the number of people called and that refuse v the number of people that provide information plays any part in the MOE or is a weighting factor of some kind. I am tempted to discount polls because I just have to wonder who in their right mind gives up all kinds of information to strangers on the phone (?) and distrust polled info on principle. Thanks, it is always nice to be amazed. But even more so when you feel your own mind stretching a bit too. As for genes, not always as Einstein’s son proved. But some rolls of the dice give twentyfour instead of 12, and then watch out. Vi Hart is one. Are we sure that it was not a cybertron (? )who drew the figures? Thanks for this thread as there were some very interesting comments. I learned a few things. Every time I hear these polls, 45 – 48 for instance I apply the MOE and say why don’t they say that it is a statistical tie or potentially 42 – 51 (if I understand the + – part of it which I may well not) so that the numbers mean essentially nothing.